Coming to my country, you may see Vietnamese street food is very common here. When you want to know what and how our people actually have in our meals, you should taste our street foods, which is originally prepared to serve local customers. Taking a sit next to them, eating like they do, you will get wonderful dining experience that you can’t get anywhere else. In later part of this article I’ll show you top 5 common foods sold along streets in my country. Why do we call it street food? Well, that’s pretty straightforward answer. It’s simply because the food is served right along roads, in street markets, on pavement, or somewhere else in public places. Diners will not sit and eat in closed spaces like dining halls or restaurants, but usually in open air, on plastic or wooden chairs scattered around food stalls. There may be some exceptions when you can find street-food in stylish, modern, clean restaurants. Pho24 restaurant chain is a typical example for what I’m saying. Why do we love Vietnamese street food? The fact is that you can get good foodstuff almost at any time, by only a few minute walking, at just a dollar or two for a meal. How do you think? Good, isn’t it? 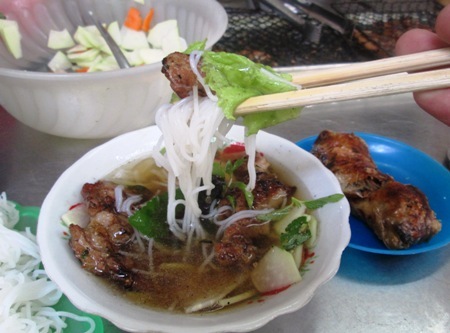 To see more reasons why people like Vietnamese street food, Click here! Is it safe to eat street food in Vietnam? That question really puts me in a dilemma, because I have two opposite answers. The first one is “No, street food is not so safe here”, especially to a stomach of Western guys. As a Vietnamese, frankly I’m tempted to promote the Motherland’s tourism and cuisine art, hence, persuade you to try our street foods without any negatively mentioning about safety matter. Yet, for the sake of you my visitor, I’ll take responsibility to give truthful information, to the best of my knowledge. My apologies, if that makes anybody uncomfortable or disappointed! Confessedly, food sanitary is still under the standard level it should be. We the natives do worry about the situation, and related authorities have applied many methods to solve the problem. Yet, the fact is still the fact, and I want you to get noticed about that issue. When travelers apply standards from developed countries, they’ll likely not dare to try food on street (not in Vietnam only). Yet, if you think more openly like locals then things may change a little. Having said that, I want to drive to the other answer: “Yes, it’s safe enough, as long as you know how to select street vendors”. Chances are you will take and manage a little risk, and get benefit of seeing wonderful culinary art of a whole country. Choose the food stalls that you can see cooks preparing with fresh ingredients, and right in front of you. Choose the booth with no or only a few flies or similar insects around. Those tiny animals signify unhygienic environment. Check cleanness of bowls, spoons, chopsticks… If those dining utensils are not clean, ex. greasy, wet, bad smelling… then you should stay away from those places. Choose high traffic vendors. The more crowded, especially with locals, the better quality. Many customers mean fresh ingredient and good food. Look around the tables, if you see many tissues on the ground, that’s the sign of many diners having just left, and that’s usually a good (and safe) place. Get advice from travel guide, local acquaintance, or online network. Dining places that many people visit but no one gets sick are good option for you. In fact, as far as I can see, Vietnamese (including me) and most of foreign travelers enjoy our street foods. So when you come to Vietnam, take a little courage to eat like Vietnamese. My additional reminder, in case you try Vietnamese tasting street food, it’s good and safe idea to bring along some antibiotic medicine like Cipro, just in case (I hope I’m somewhat overestimating the problem). And now, it’s time to talk about the main content of the article. I want to introduce the top 5 Vietnamese street foods that you shouldn’t miss when staying in my country. 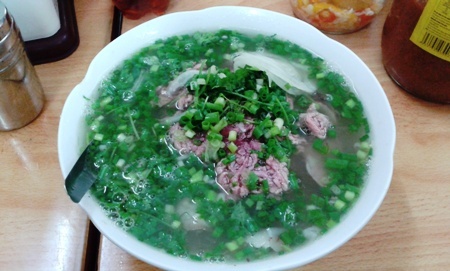 Pho is a kind of special noodle that Vietnamese and foreigners love to eat. It is an “ambassador cuisine” that helps to introduce Vietnamese foods to the world. 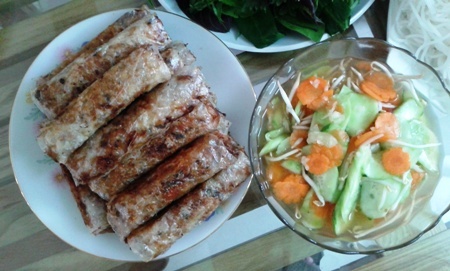 Together with Summer Rolls (Gỏi cuốn), Pho was proudly listed on "World's 50 most delicious foods" by CNN. It includes flour noodle served with special sauce, and chicken or beef. Cha nem is our very popular Vietnamese appetizer in the south. In the northern region, we also eat it together with vermicelli as a main course. It includes many ingredients such as pork, shrimp, wood ear, mushroom, carrot, onion, etc. The variety of ingredients makes the unique flavor of Vietnamese spring rolls. When tasting it, you will savor various feelings of crispy wrap, sweet meat, sour and chilly dipping sauce. It’s totally tasty. The food is made of rice vermicelli, char-grilled pork in pieces or patties, eating with Vietnamese dipping sauce and herbs. You’ll feel unforgettable flavor and sweet of barbecued pork mixed with herbs, taste of dipping sauce … all in Vietnamese style. It is known as Vietnamese steamed rice rolls or rolled cake, which is a common food for breakfast. Essentially, it is a flat piece of steamed rice, which is cut in part or made in rolls. The latter can be stuffed with minced wood ear and chopped pork. You will eat with herb and special dipping sauce that made only for Banh Cuon. Without the sauce, you’ll feel a little sour and not tasty at all. This is typical dish from the south, used commonly as an appetizer. 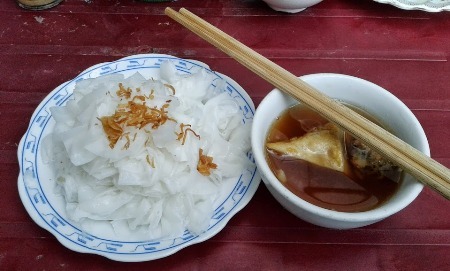 It is basically rice paper round wrapping many things, including: pork slices, prawn, rice vermicelli, lettuce, Chinese chives … To savor full flavor, you should eat summer rolls with a dedicated dipping sauce called tương meaning bean paste, or lemon garlic fish sauce. Do you want a visual illustration about those foods? Let’s watch two Western men talking about Vietnamese Pho, Cha Nem, and Banh Cuon while eating on street stall in Vietnam, perhaps in Hanoi. Check it out. Besides, upon tasting, you may love Vietnamese street food and want to cook yourself, then a good cooking book like Vietnamese Street Food will be very helpful. In this article, I’ve shown you why people like Vietnamese street food, and whether it’s safe to eat that food in Vietnam. I’ll also demonstrate the most common dishes that you should not miss to try. I do hope you have chance to taste and like Vietnamese street food. If you’ve eaten, how do you think? What’s your favorite? Please share some comments here? We’d love to hear from you. By the way, if you find useful information in this article, would you mind click the Like button to encourage me? I’d love your thumb up!